Sometimes it works, other times, not so much. But the way I see it, the worst possible outcome is having spent a few for a strange-tasting snack. Lately I’ve had the gumption of making a wasabi-flavored aioli spread. Swap out the dab of Dijon mustard that usually accompanies the garlic, olive oil and egg yolk in aioli with a dash of spicy wasabi powder instead (or freshly grated wasabi if you’ve got it) — that seemed like a logical twist on a classic. But when I got the ricotta another idea presented itself. I decided to poll my foodie friends via Twitter (a technique that I rather enjoyed, and will probably do again). I tweeted, “Wasabi aioli or wasabi-spiced ricotta: what sounds more appealing?” The majority of the responses that came back were in favor of the aioli. 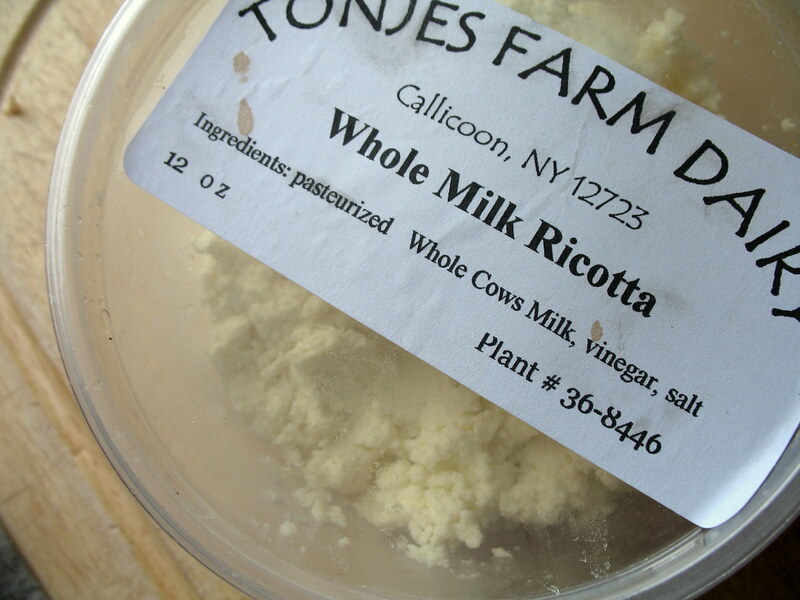 But I was surprised by the number of voices (from folks whose opinions I value) that actually rooted for the ricotta. I liked the way my friend Josh put his opinion: “The aioli, definitely. 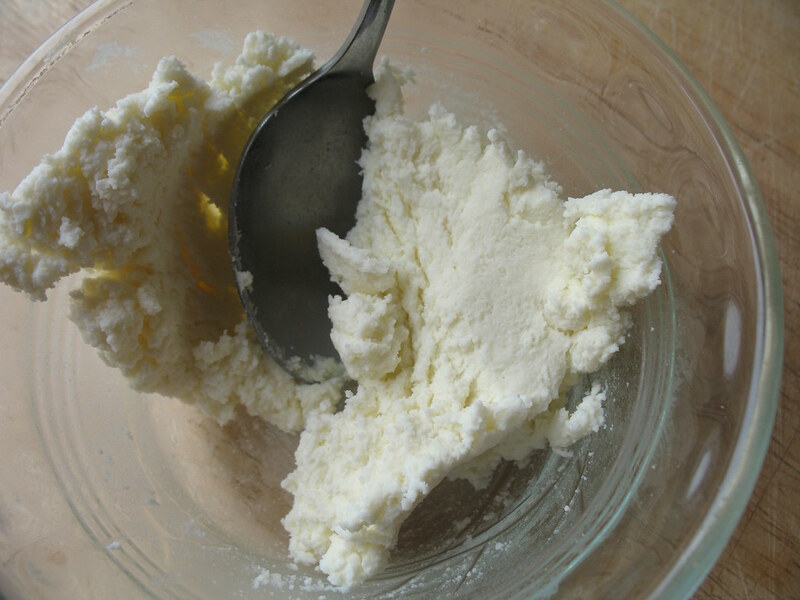 But the ricotta sounds more risky/interesting.” Now who’s shy of a little recipe risk? Also picked up at the Greenmarket that day, for no apparent reason at the time, were a quarter pound of shiitake mushrooms. 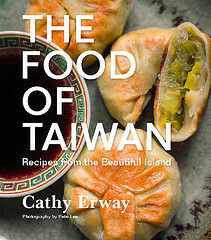 Growing up I’d only encountered the things dried, like shriveled black rounds of coral, their flavors so concentrated as to smell like the sea (my mom had an empty spaghetti sauce jar full of these that sat in the back of the pantry for years; two or three might be taken out at a time to soak in hot water until reconstituted and toss into stews). The fresh version I prefer today are still powerful in flavor, but it’s a much more subtle whiff of oyster, and the texture’s no longer rubbery, though dense. Sauteed until just cooked, with a dash of salt, I thought they might have just the right stuff to complement, not compete with, some ricotta lightly tinged with wasabi. I’ve made mayonnaise flavored with wasabi powder before, so I tried the same combination with ricotta. Along with the greenish spice powder I mixed in some rice vinegar, salt and a dash of sugar. This ricotta was so thick and clumpy that it definitely needed the splash of vinegar just to mix it all up. 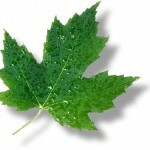 But its richness and thickness is what really struck me about it. It’s nothing like your average pint of grocery store ricotta, with the watery layer that likes to separate from the rest of your food. Artisanal ricotta makers have redefined the cheese for me. This one was made by Tonjes Farm Dairy, which sells cheese and milk at the Union Square Greenmarket on Saturdays. Highly recommended. Of course, I tasted each part of the puzzle before putting it all together — the wasabi-spiced ricotta, which I licked from every inch of the spoon, the sauteed shiitake mushrooms, and the slice of half-whole wheat No-Knead bread from the other morning. Oh, but not the scallions. I thought these would add a little crispness and freshness to the finished dish, but eating scallions alone is just weird. When it was all layered ceremoniously on top of one another, sprinkled with a bit of sea salt, and bit into, my risk paid off. 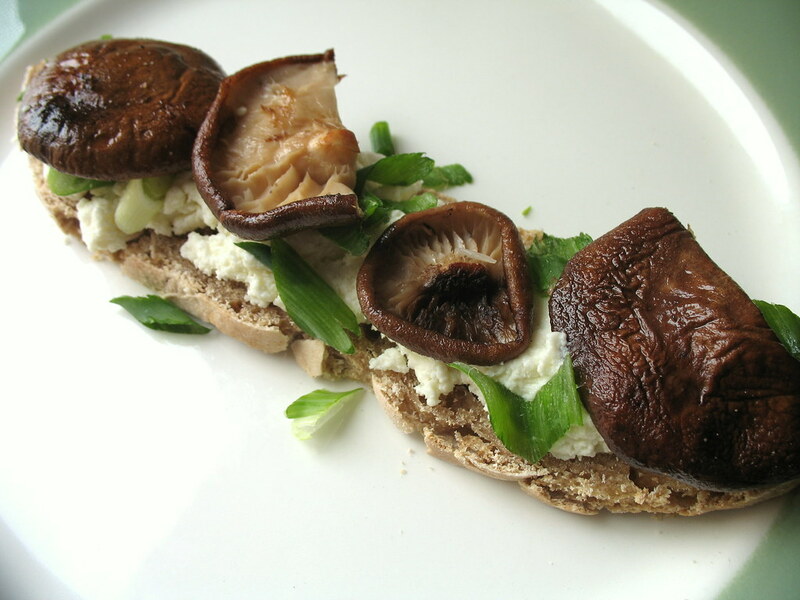 I don’t really know what to call this — an open-faced shiitake sandwich? Bruschetta or crostini? “White pizza” with cold ricotta and warm mushrooms? Whatever it is, it’s tasty. Grade A “good.” And you definitely won’t find it anywhere else but at home. 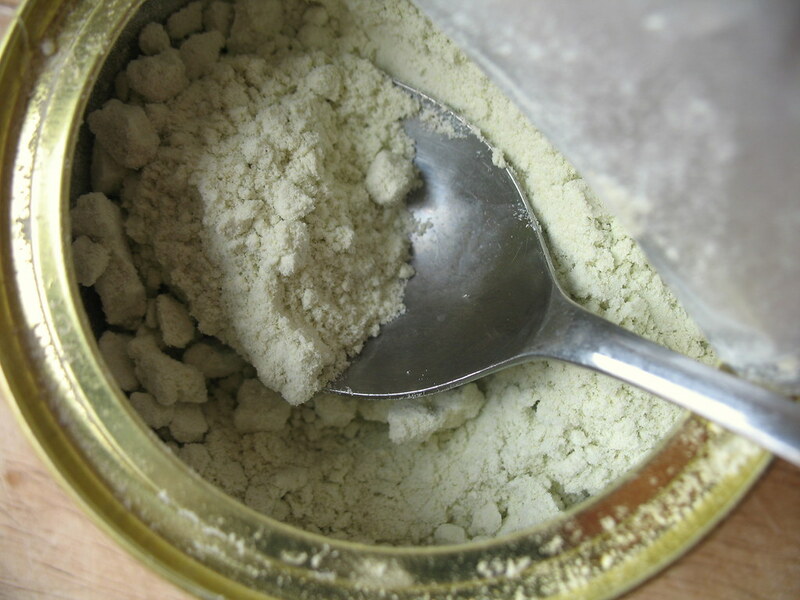 In a small bowl, combine the vinegar, wasabi powder, salt and sugar. Mix until blended, then add the ricotta and stir to blend. Taste, adding any additional spices as desired. Heat a heavy-bottomed skillet with the vegetable oil. 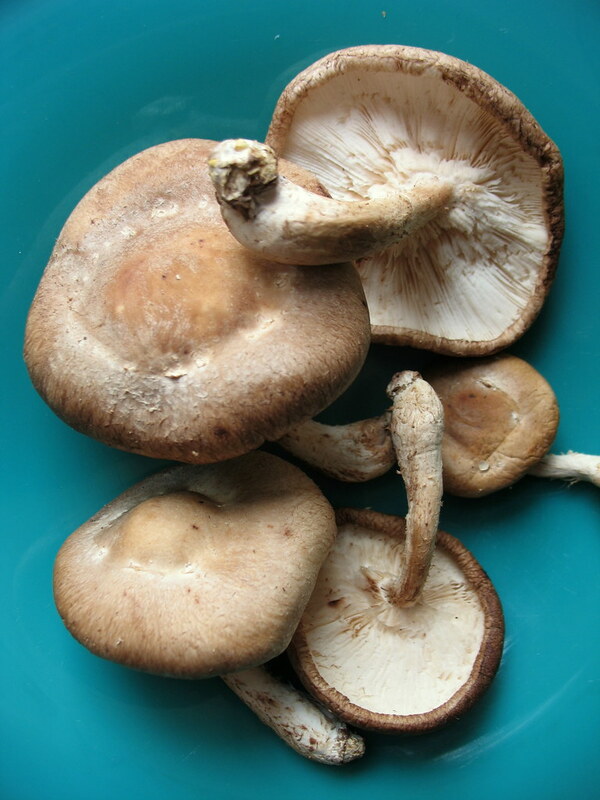 Slice any extra large shiitake caps in halves or quarters. Once pan is hot, add mushrooms and cook on each side for about 2 minutes each, or just until its liquids have mostly cooked off. Sprinkle with a little salt while cooking. Spread the ricotta on the bread slices. 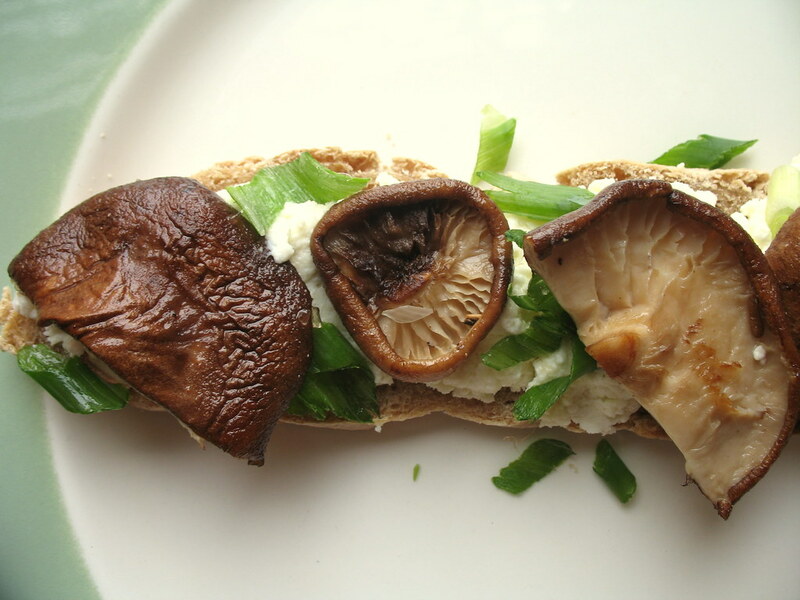 Arrange the mushrooms and scallions on top, and serve. Five brownie points: Ricotta is naturally rich in calcium, though you’ll want to go easy on it if it’s whole milk, for cholesterol’s sake. Mushrooms in general might not offer the same hoard of Vitamins A through K and then some like most fresh veggies and fruit, but studies have shown them to have interesting compounds like selenium, a supposed cancer-fighting nutrient, and lentinan, thought to promote the immune system. In addition, shiitake mushrooms provide some antioxidants, iron, and potassium — that’s not talking about the dried type, though. Seven brownie points: I was talking to a farmer in the Catskills region of Upstate New York recently — a future post, probably — about what he deemed the impending doom for dairy farmers in that area. With milk and animal feed prices soaring, he believed there was no hope in sight. As a NYC consumer, I can only hope that our purchasing power at the Greenmarkets will help some continue to make ends meet, since humane animal raising’s so important to defend, and their food quality so exceptional to add. Anyway, that’s the story with the ricotta — the other main ingredient, shiitake mushrooms, were also small and locally farmed. Out-of-season scallions, not so. I voted ricotta for the same reason as Josh. It doesn’t seem a huge leap from chipotle to wasabi aioli and the ricotta just sounded more interesting. Glad it turned out well. Congrats on being mentioned on Slashfood.com!